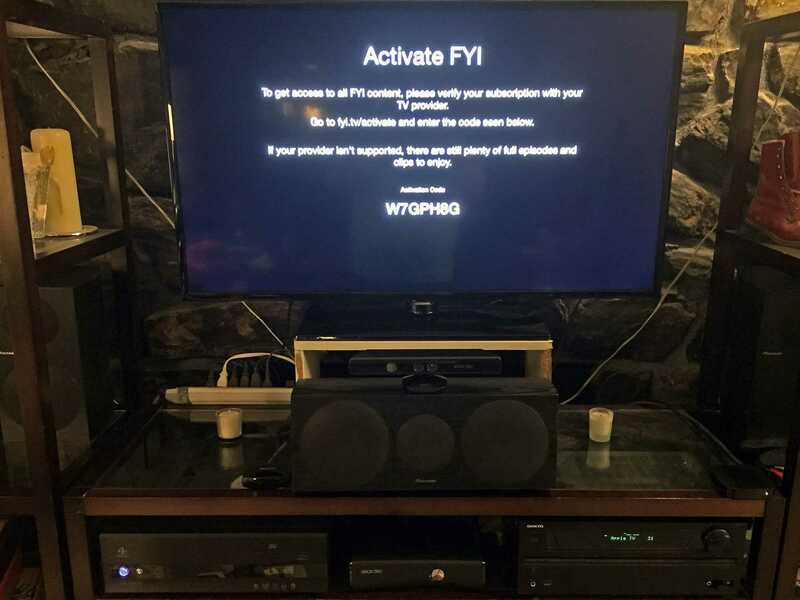 If you’re an Apple TV user and a Comcast Xfinity subscriber, you’ve probably wondered why the steps to activate certain channels on the Apple TV don’t work. It doesn’t seem to be an issue with Apple’s software. It appears that Comcast doesn’t want certain channels like History, AETV, Lifetime, etc. available to Apple TV users. Comcast is actually dense enough to make this a difficult process without any justification besides its own ego. It’s not the first time they’ve been stupid; they’ve done much worse. We’re still going to tell you how to fix your Comcast Xfinity Apple TV activation. The authorization for these channels actually works, but none of the channels lists Comcast as an option during the normal process. Thankfully, an adept fellow posted the authorization URL to Comcast’s forums so we can manually input the Comcast Xfinity Apple TV activation. Open your browser, navigate to xfinity.comcast.net, and sign in to your account. On your Apple TV, navigate to a channel that requires authorization. When you try to sign in, it will give you an activation code. Keep this up on your TV. Don’t navigate anywhere else. Come back to this post and copy the corresponding channel URL. Go back to your browser and paste the URL into the address bar – but do not hit enter. Find the ******* in the URL and replace the stars with the activation code as shown on your TV. All letters are uppercase. Then hit enter and wait. It could take up to 15 seconds, but the Apple TV should show the success message. Make sure you complete all of those steps within a couple minutes. The Apple TV activation codes expire quickly, and you’ll have to restart the process at Step 2 above. To activate another channel, just repeat the steps above with the channel you want. You do not need to sign in to your Comcast account for each channel. It’ll remember your account details after the first step. We’ve included the currently available Comcast Xfinity Apple TV activation URLs in this list. Currently, we only have Comcast Xfinity Apple TV activation URLs for these channels. If Apple adds more channels within Comcast’s service offerings, we’ll do our best to add those as we see them. Not currently compatible with these methods. We tried to make this as simple as possible. As with anything slightly technical, this process could prove difficult. If you follow our instructions correctly, you shouldn’t have any trouble. However, if you find yourself having trouble with the Comcast Xfinity Apple TV activation, leave us a comment and we’ll try to help. Do you have a Roku or Xbox? Shout out to Carol for testing this on a Roku. It looks like you can use the same URL structure to activate a Comcast channel on the Roku. You just have to replace “appletv” at the end of the activation URL with “roku” – simple enough. I don’t have a Roku to test it, but the logic makes sense. According to Philip, this works with “xbox360” as well. It’s probably safe to assume it’ll work with “xboxone” too. You shouldn’t need those for any of the device-agnostic channels like HGTV, FN, or TC. Let me know if those work for you. I no longer have Comcast TV service (shocker). So I can’t test these URLs, but it appears that HGTV, Food Network, and Travel Channel all share a similar URL structure as the previously working channels. They don’t need a device listed at the end of the URL string, just their “thanks.html” page. Simple enough. I’ve added those to the list here. Let me know how they work for you in the comments. CNNgo still requires a unique session token for each activation that we can’t replicate with this simple URL scheme. Thanks to Carlos, Martin, and Jason for testing the new channels and working out this URL structure. If anything else works by following the same or a slightly modified structure, please let me know. Enjoy! If you are comfortable using someone else’s website to generate a simple URL for you, find Jason Hinkle’s comment in the comment section. I don’t know him or his software, so I can’t recommend it outright. I did look at his source code after generating a test URL; it seems to be legit right now. I don’t believe there is any way for him to obtain any of your information from the activation process, so it should be safe (hopefully). eciov offers no warranty to that effect. It looks like Mel Ludowise made a quick web app on github. It may be the same thing Jason Hinkle shared in the comments a couple years ago. Point being, if you don’t want to go through the manual process of our instructions above, you can just use the web app here. If you have a different device, like a Roku, or a different service provider, like Charter, you might be able to ping Mel and ask for an update to the web app to include those options. Here is a list of tv channel apps that authenticate with Comcast’s Xfinity service when using the latest version of Apple tvOS. If you’re using the old version of the Apple tvOS, then you may still have to resort to our URL trickery above (and you probably don’t have most of these apps). It also seems that these apps don’t work with Apple’s Single Sign-On if you’re a Comcast customer… shocker. You have to authenticate each of them separately because Comcast is, well, stupid. If it’s not on that list, it doesn’t work. Why? Because Comcast hasn’t come to an agreement for streaming those channels on the Apple TV. Each channel/network has to negotiate a streaming contract on a per-platform basis. It’s possible that some of these channels will authenticate on a different platform, but Comcast and the channel/network haven’t come to an agreement for the Apple TV as a platform. Some of you noticed that your Roku authentication stopped working recently… I’m willing to bet it’s because of these contract negotiations that happen behind the scenes. It’s dumb, I know, but I don’t make the rules. It doesn’t mean that these channels won’t work in the future, but they currently do not authenticate. That’s it for this update. As always, we try to maintain this article with as much new information as we can. If you have feedback or questions, please leave them in the comments. If you’ve heard of a change in Comcast’s contract negotiations, let us know so we can move channels around. Thanks!